Ladies~Show your fashion flare with one of our most popular boots. From skinny jeans to mini-skirts, this boot takes you through the seasons. 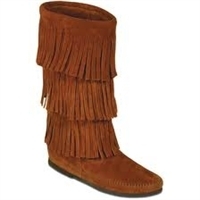 Ladies~Five layers of fringe flare make these boots the undeniably chic, head-turning boot for every season. Ladies~The classic pug boot style. Genuine sheepskin so warm and cozy, you'll be prepared for anything Mother Nature throws your way.